These days we all travel with two forms of ID: our passport, and our face. About four billion passengers are expected to travel this year, and by 2036, the International Air Transport Association (IATA) expects that number to double. 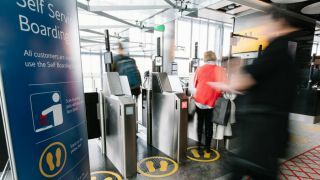 In an attempt to avoid bottlenecks, airports have been introducing automated ticket and passport gates for the last decade, but now comes biometrics and face recognition. Able to identify you from the features of your face, the latest systems are spreading fast. Do you have a brilliant idea for the next great tech innovation? Enter our Tech Innovation for the Future competition and you could win up to £10,000! Why do we need automated systems at airports? More of us travel more often than ever, so the way we travel through airports is being streamlined. “Automatic check-in kiosks and automated bag drop-off points have revolutionized the check-in process,” says Nora Blomefield, Head of Marketing Travel & Border at digital security company Gemalto. Blomefield claims that travelers checking themselves in reduces their total waiting time by 30% compared to using traditional check-in desks. The next step in streamlining the process still further is to remove the need for ‘physical tokens’ – the boarding pass and the passport – from the airport process entirely. Why do we need face recognition at airports? The key to avoiding crippling congestion in airports is to keep crowds of people moving. “The passenger will be able to simply walk through, from curb to gate, using his face as a single identifier,” says Blomefield about the face-based future of flying. The idea is that cameras can verify each passenger at the start of a journey, then authenticate them at every other step: check-in, baggage drop, security check, and boarding. Every time you go to an ePassport gate at an airport, your face is being checked against the photo in your passport. “The passenger submits his ePassport and is then compared live against the picture stored in his passport chip,” says Blomefield, whose company's Live Face Identification System takes things on much further. How do self-service boarding gates work? Although it’s not replacing passports, face recognition is already making paper ID less important. At Heathrow Terminal 5, British Airways now has three self-service boarding gates for UK domestic flights, where each passenger's face is photographed, along with their boarding pass. Passengers scan their boarding pass then walk onto the aircraft. What’s going on behind the scenes is this: a digital facial scan of each passenger is recorded when they travel through security, and when they arrive at the gate their face is matched when they scan their boarding pass. As well as convenience, this system – built on Aurora face recognition tech that uses near-IR sensors – essentially prevents international travelers from swapping tickets with a domestic passenger in the departure area. “All domestic travelers must be verified using face recognition before they can leave the lounge to enter a domestic gate or pier,” says Dr Nick Whitehead, Head of Strategic Partnerships at Aurora. “This means that 12% of all passengers using Heathrow are verified using Aurora technology, and have been for the past five years.” The system can confirm the identity of the average passenger in five seconds. Can face recognition systems be trusted? This is about saving time, not being 100% accurate. “Face recognition can enhance the checks, not because it’s foolproof, but because it is consistent,” says Whitehead, adding that if there’s doubt, a manual check is triggered. “Humans are superb at dealing with exceptions,” he says. “The machine takes away the mundane, leaving the operators free to focus.” Besides, people want self-service airports, and the less they have to deal with officials, the better. ePassport gates are called ‘one to one’ verification, but what’s now coming in is ‘one to many’ verification, where your face is checked not only against your passport photo, but also against a database on the cloud of ‘wanted’ people. The third type of face recognition is ‘few to many’, where cameras can study a crowd of people and cross-reference the faces it finds with a database of photos; in short, it can find people in a crowd. ”Live Face Identification System can provide both types of verification, and is capable of searching for faces in a crowd, to ensure watertight security and identify suspects,” says Gemalto's Blomefield. Does that sound sinister? It shouldn’t; such techniques are being used not only to add an extra layer in security by continually authenticating passengers, but also to find people in airports who are holding up flights. Will it one day be possible to travel without showing a passport? Almost certainly, at least for frequent ‘trusted’ flyers. In fact, passport-free travel is already being trialled in Australia. However, there's a catch: nobody yet knows what a ‘digital passport’ means, and whether it should stored in a phone, be usable in places other than in airports, and how the information on a digital passport is shared. “Airports, border agencies and airlines will have to work together,” says Blomefield, whose company has also developed virtual passport tech. However, it should be stressed that passport-free travel, at least at first, will only apply to those ‘on the list’; frequent flyers will have to go through a registration process that essentially puts their face in the cloud for ePassport gates to look for. Who is paying for face recognition tech? Check-in, security zones, boarding the aircraft, and immigration are all separate operations, which makes working out who pays for the technology to be installed and maintained a complex issue. On the one hand, it’s mostly airports that are installing face recognition tech. “Airports are increasingly using biometrics to make the security process smoother [and are] often the buyers of eGates in order to speed up the immigration process,” says Blomefield. If one airline owns the terminal – such as British Airways at Heathrow Terminal 5 – it’s the airline that pays. “Face recognition technology has recently made a huge leap forward in terms of accuracy, thanks to the introduction of artificial intelligence and deep learning,” says Whitehead, who expects a wave of new face recognition adoption now that it’s been successfully installed in high-profile airports. In terms of technology, the next wave will probably need to use blockchain if, post-GDPR, such systems are to overcome the need to collect the same data each time someone travels. To see how it can be done on a bigger scale, check out China, where face recognition is all the rage. Should your face be your passport? Or is face recognition a scourge on those who want to remain anonymous? You decide, but it might get you through the airport quicker next time without you even realizing it – and that’s always going to put a smile on your face.